Think of Newport Rhode Island and most people think of mansions. Beginning in the late 19th century through the early part of the 20th century, these famous homes served as the summer playground for America's wealthiest families. From the Vanderbilts to American tobacco heiress Doris Duke, these colossal estates were built as their summer retreats overlooking the crystal blue waters of the Atlantic surrounding Newport. 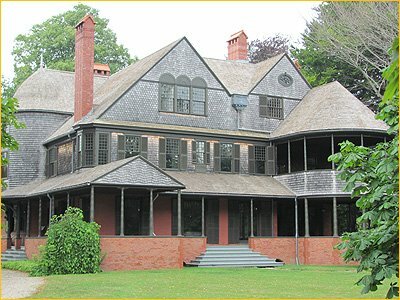 No expense was spared in the construction of these summer "cottages", and their grandeur lives on today through the efforts of the Newport Preservation Society and the Newport Historical Society. They have become famous around the world for their decadence and grandeur, and offer visitors a look into the lives of the wealthiest industrialists of the last century. Life for the residents of these summer homes was no picnic... it was a party, and they took their jobs very seriously. With such a close concentration of wealth, each house that rose from the ground was more ornate than the last. It was a competition of whose wealth would outdo the other, and their homes became the reflection of that desire. The inspiration for the architectural designs of these mansions came from the castles of Europe, and many of the materials used in the construction of these houses came from overseas. Even the landscaping, including trees and other plants, made their way from western Europe and as far away as the orient to grace their properties. Even today, many of the trees in and around Newport are from the far reaches of the globe and are a destination in and of themselves. You can even download a free tree map at the Newport Arboretum website and tour these exotic and historic trees in Newport. Since these homes were created as summer escapes, virtually all of them are not winterized and are open on a limited basis in the off-season. Some of them are meticulously decorated for the holidays, and can make a trip to see them a truly magical experience. 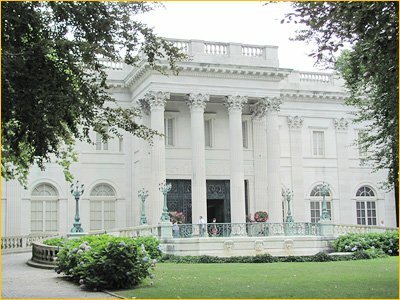 In the summer they host the annual Newport Music Festival, which features dozens of performances by solo artists to orchestras, making the mansions come alive with both the music of their time and contemporary artists. In addition they play host to a variety of other events, including the annual Newport Flower Show, the Wine and Food Festival, private events and countless weddings during the course of a year. The easiest way to purchase tickets for more than one mansion is to go to the Visitors Center on America's Cup Avenue. You can also buy tickets at each home, or in advance online at The Preservation Society of Newport County, where you can print your tickets on your home computer. *BECOME A MEMBER OF THE SOCIETY and get free admission to most tours along with special event pricing! 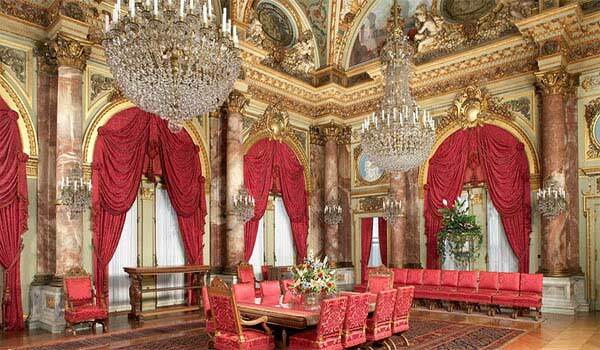 The Breakers was built in 1893 by Cornelius Vanderbilt II. Mr Vanderbilt commissioned architect Richard Morris Hunt to design a 70-room Italian Renaissance-style palazzo inspired by the 16th century palaces of Genoa and Turin. The home is over 125,000 square feet with over 62,000 square feet of living space on five floors. It sits on 14 oceanfront acres with sweeping views of the Atlantic and features a working carriage house located a few blocks away on Coggeshell Avenue. The carriage house is also open to the public and features a working garden in the rear of the property. The grounds are meticulously landscaped with trees and plants from as far away as Africa, providing a natural screen from the bustle of Ochre Point Avenue. 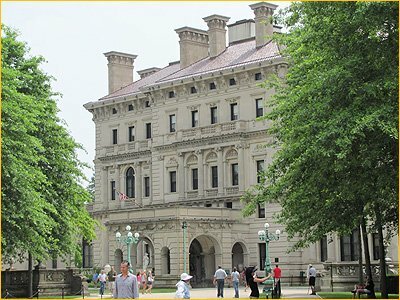 The Breakers is often considered to be one of the most opulent Newport mansions and is the most-visited attraction in the state of Rhode Island. 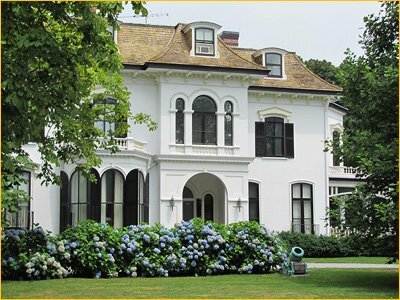 The first of the summer cottages on famed Bellevue Avenue in Newport, Chateau-sur-Mer brought about the beginning of the Gilded Age in Newport RI with its palatial victorian architecture and furnishings. Owned by a China trade merchant named William Shepard Wetmore, he died in died in 1862 and left the bulk of his fortune to his son, George Peabody Wetmore, and a generous allowance for his daughter, Annie Derby Wetmore. It was the scene of memorable entertainments, from the "Fete Champetre", an elaborate country picnic for over two thousand guests held in 1857, to the debutante ball for Miss Edith Wetmore in 1889. George Peabody Wetmore had a distinguished political career as Governor of Rhode Island and as a United States Senator. He died in 1921 and his wife in 1927. They had two daughters and since neither of them ever married, the Preservation Society purchased this home in 1969. An Italianate-style estate, Chepstow was built in 1860 and contains the original furnishings with important 19th century original paintings adorning its walls. 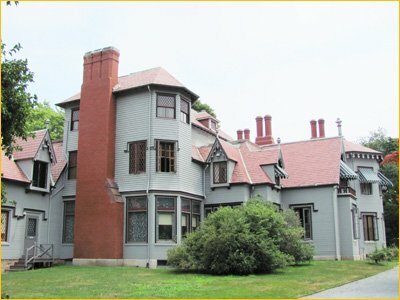 It served as a summer residence to Edmond Schermerhorn and was eventually acquired by Mrs. Emily Morris Gallatin in 1911. The home was kept in the Morris family until bequeathed in 1986 to the Preservation Society, with its collections intact and an endowment by Mrs. Alletta Morris McBean. The Elms was the summer residence of Mr. and Mrs. Edward Julius Berwind of Philadelphia and New York. Mr. Berwind made his fortune in the Pennsylvania coal industry. In 1898, the Berwinds engaged Philadelphia architect Horace Trumbauer to design a home modeled after the mid-18th century French chateau d'Asnieres (c.1750) outside Paris. The interiors and furnishings were designed by Allard and Sons of Paris and were the setting for the Berwinds' collection of Renaissance ceramics, 18th century French and Venetian paintings, and Oriental jades. Just a short walk from the center of town, this is one of the easiest mansions to get to on foot. Its manicured back lawn and gardens is just as impressive as its interior. Built in 1883 for Isaac Bell, a wealthy cotton broker and investor, this beautiful home displays one of the best surviving examples of shingle-style architecture in the country. It is a combination of Old English and European architecture with colonial American and exotic details, such as a Japanese-inspired open floor plan and bamboo-style porch columns. The exterior of the house has been extensively renovated and interior restoration work has been done as well. Kingscote, built between 1839 and 1841, is a classic mansion and landmark of the Gothic Revival style in American architecture. Kingscote is considered to be one of the first of the summer cottages to be built in Newport starting during what was known as “the cottage boom”. In 1893 a man by the name George Noble Jones commissioned architect Richard Upjohn to build his cottage. At the outbreak of the Civil War, Jones and his family left their Newport home and never returned. It was sold and eventually left to a man by the name of David King who had the cottage enlarged. Today it is a rare example of a Gothic Revival house and landscape setting preserved intact with original family collections. This opulent estate is clearly one of the most famous mansions in Newport. 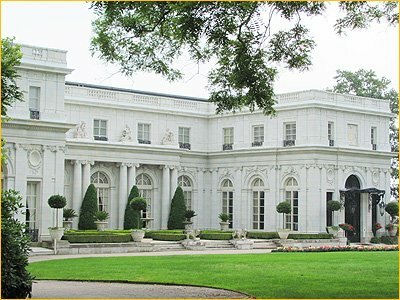 Living up to its name, this "summer cottage" used 500,000 cubic feet of marble in its construction by the Vanderbilts. 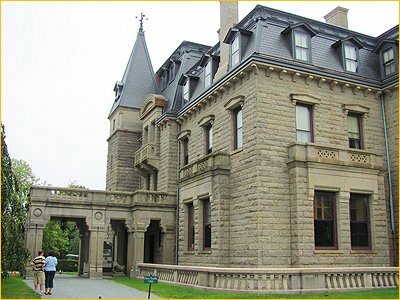 William L Vanderbilt had this home designed and built as a birthday present for his wife’s 39th birthday. He was also the brother of Cornelius II who owns the Breakers. The house was also designed by the architect Richard Morris Hunt, inspired by the Petit Trianon at Versailles. The cost of the house was reported to be around $11 million, of which $7 million was spent on 500,000 cubic feet of marble. It was a social and architectural landmark that set the pace for Newport's subsequent transformation from a quiet summer colony of wooden houses to the legendary resort of opulent stone palaces. 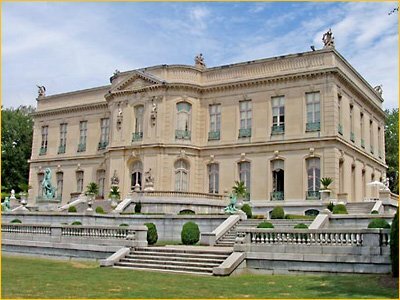 Commissioned by Nevada silver heiress Theresa Fair Oelrichs in 1899, architect Stanford White modeled Rosecliff after the Grand Trianon, the garden retreat of French kings at Versailles. After this home was completed in 1902, at a reported cost of $2.5 million, Mrs. Oelrichs hosted fabulous parties here, including a fairy tale dinner and a party featuring famed magician Harry Houdini. This tradition continues on today with many wedding and social events taking place inside and on the grounds of the mansion. 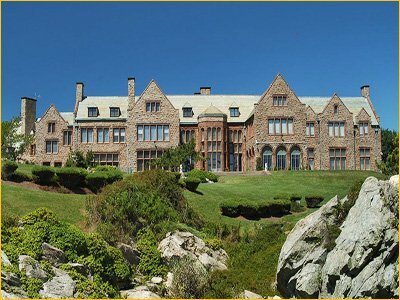 In addition, many Hollywood films have been shot on location at Rosecliff such as the Great Gatsby, True Lies, Amistad and most recently 27 Dresses. It was purchased by billionaire CEO Larry Ellison a few years ago and is currently in the process of being completely restored to include an upstairs residence and downstairs museum to house his private art collection. Former home of American tobacco heiress, Doris Duke. It sits majestically atop a rocky outcropping at the end of Newport's famous Cliff Walk and has beautiful ocean vistas from just about every room. The stunning oceanfront Newport RI mansion still maintains the look and charm as when it was occupied by Ms. Duke, including personal items and original furnishings. One of the area's most remarkable collections of private art. A truly astounding display of wealth in one location. A must see while visiting Newport RI. To purchase Rough Point mansion tour tickets, go to the Visitors Center on America's Cup Avenue, buy in person at Rough Point, or in advance online at The Newport Restoration Foundation. NOTE: This mansion is one of a few attractions in Newport including Whitehorne House and Prescott Farm in Middletown that is NOT run by the Preservation Society.